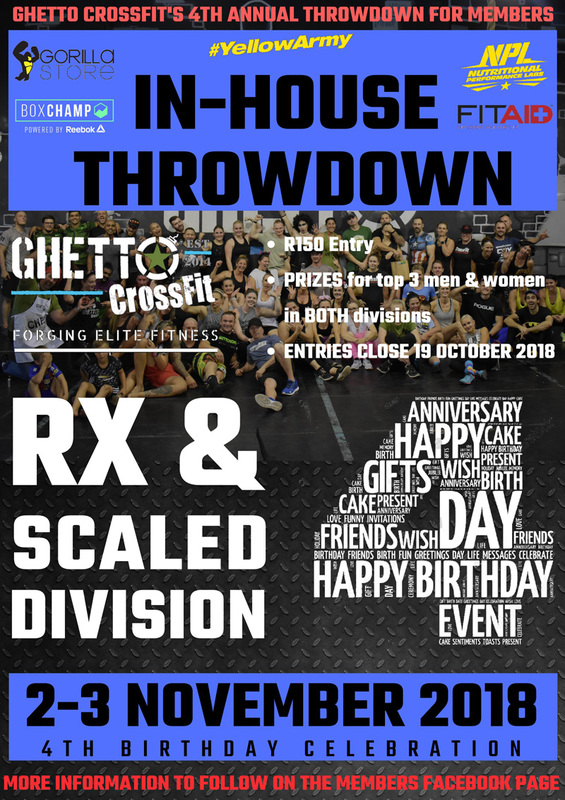 It’s a fitness competition for all members of Ghetto CF. An opportunity to test the fitness you develop in training, a community get-together, and exposure to the other side of CrossFit – competing. You compete in 4 events. Each event is like a workout you will have done in class. There’ll be a mix of strength, skill and conditioning in the events. After all of that, we hang out over some food and drinks! Absolutely! Every class you come to is a challenge, so each event will be a challenge too. But it will only be as tough as you want it to be. While we will be awarding prizes to the winners, the real intention of the event is participation & celebration. The most challenging part of the event is having to do the four workouts, but what we do in class will have you more than ready. The coaches will also be on hand to ensure that no one is stuck trying to do something they genuinely cannot – your safety is everything to us. If you’ve completed our Foundations Program, and trained in the regular classes consistently, you’ll be adequately prepared. There will be different levels of programming, just as we do in class, and it will be programmed for the everyday CrossFitter. Yeah, right! As Tommy Hackenbruck says, "You don’t need harder workouts, you need to go harder in your workouts." The events will be programmed to challenge the fittest athletes we have, while being safe enough for our least experienced athletes to perform.